You know the scene in Don’t Look Back where Donovan and Dylan are exchanging songs in a hotel room? And Donovan sings the perfectly innocuous “To Sing For You,” to which Dylan responds with a scathing rendition of “It’s All Over Now Baby Blue”? And he looks directly into the camera and sings with exaggerated diction the couplet, “Yonder stands your orphan with his gun/Crying like a fire in the sun“? And you don’t know whether he’s putting you on, reveling in the singularity of his word choices, sharing an inside joke with D.A. Pennebaker, or simply casting about for some way — any way — to sell a song? That’s the sense I get from Noel Torres when he over-enunciates his way through ballads these days. True, Luciano Luna doesn’t write with the colorful precision of “Baby Blue” — he’s more in the ballpark of “Make You Feel My Love” — but Torres is bringing that precision to singing Luna’s ballads, which may be even more important. When playing his own songs, which is usually, [Torres] arranges them into short masterpieces of precision and control. He tosses off riff after riff, their notes connected by chromatic flurries, then hits startling passages of kickass mind-meldery with the rest of the band while he’s singing. That is, he’s precise, controlled, and tossed-off, the sweet spot for much pop music, if not Western music in general. It’s stomp and swerve; or, as they used to teach us in classical piano lessons, technique and expression. This isn’t a dichotomy or a balance so much as a tug of war, and if you’re playing an instrument, the tug of war conveys the tight switchbacks of human thought better — that’s to say, with more convincing illusion — than either wind-up-toy virtuosity or lazy splats of rubato. And yes, it’s always an illusion. You’re not gleaning the innards of Torres’s mind directly from air moved through the folds of his squeezebox or voicebox, but heaven know he makes you believe you are. In this spirit have I grappled with last year’s album by Remmy Valenzuela, De Alumno a Maestro (Fonovisa). Valenzuela is a corridista in Torres’ mold: he writes, sings, and leads the band, but mostly he plays his accordion like a beast. He’s got some good songs, too. His radio hit “Te Tocó Perder” switches tempos confidently, something you rarely hear on the radio; the breezy dance tune “El Borracho” sounds like something Kenny Chesney could adapt from his old blue chair. (Assuming he can get Google Translate on the beach.) 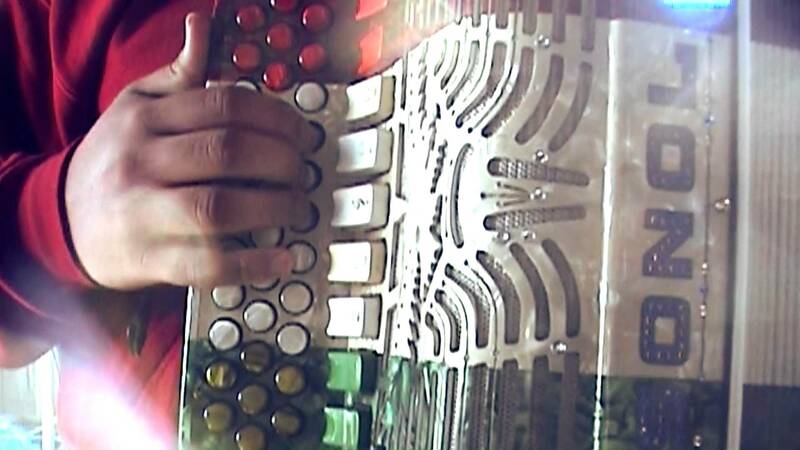 If I were judging conjunto contests, Valenzuela would receive the one-plus rating his fingers so richly deserve. In the comments of his ratings sheet, though, I would advise him to avoid turning into DragonForce. Valenzuela has yet to make his accordion and singing speak for themselves; right now all the accordion really says is, “I can play faster than whoever the DJ plays next.” That’s something. But it’s not the same as Torres’s trademark riffs — notes connected by chromatic flurries — that say, “Not only can I play faster than the next guy, but SOY NOEL TORRES; Y YO SOY EL AMO.” Valenzuela and his skilled, polite band sound like they want pats on the head; Torres and his bunch make you wanna cover your head. Still, Valenzuela’s album is fun and merits a polite VALE LA PENA. In the most recent issue of revista Triunfo, a third young turk named Alfredo Olivas shows that he grasps the issue, which I’ll shorthand “Should a Virtuoso Have a Personality?” He says, “A lo mejor no soy a mejor, pero sí tenemos un estilo ya muy marcado.” — roughly, “Maybe I’m not the best [accordion player], but we have a style all our own.” Listening to his 2011 album Así Es Esto (Fonovisa) and his new one Privilegio (Sahuaro/Sony), he may have a point. Granted, back in 2011 his style’s most distinctive technique was a sound many (read: “zero”) accordion experts call “sawing.” Since then he’s developed more finesse and his singing has gained authority, especially for a young guy. (Olivas is 20 but he sounds about twice that.) So far Privilegio is the year’s highest profile norteño release, but I still need more time with it.